Want the best available media streaming experience at the lowest possible price? Well today is your lucky day. The big sale Amazon kicked off earlier this week is still going strong, and several different Fire TV devices are discounted. The new Fire TV Cube that’s basically a Fire TV combined with an Echo Dot is on sale for $79.99 instead of $120, and the 4K Fire TV dongle can be had for $39.99 instead of $70. 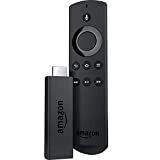 But the Fire TV Stick with Alexa Voice Remote is still the most popular streaming device Amazon makes by a wide margin, and it’s on sale right now at its lowest price since Prime Day.